August | 2010 | Renowrites blog! Do we need more vampires? The term paranormal has caught on in the publishing industry the last few years. Paranormal is a term used to describe the parallel worlds of ghosts, vampires, werewolves, shapeshifters, witches and usually these creatures interact with humans who find them dangerously attractive. Or it’s a story about a human with special powers. Whatever the story and the degree of its paranormal elements, it is my opinion that the vampire has led the charge in the popularity of the paranormal genre. With the success of Stephenie Meyer’s Twilight, Charlaine Harris’s True Blood, Richelle Mead’s Vampire Academy Series, L.J. Smith’s The Vampire Diaries and J.R. Ward’s, The Black Dagger Brotherhood (as well as a bunch of other awesome titles I know I’m missing), will readers be vampired out in the near future? Or are vampires here to stay? I’m in my mid-30’s, male, watch sports, officiate basketball and football, love baseball, eat steaks, enjoy a good MMA and boxing fight, listen to hiphop and pop music, a busy father of three, and by the way…I’m a member of the Romance Writers of America. I feel liberated for some reason. I really don’ know why I had–emphasize had–hesitations admitting this freely. I guess this is part of my journey as an aspiring author. I initially joined two years ago because I wanted to be around successful people in the book publishing industry. I find their experiences helpful and keeps me motivated to keep writing. I now say it proudly–I’m an RWA member!!! The San Francisco chapter of RWA has some great authors that I’ve met who have helped me along in my quest to be a respected writer. 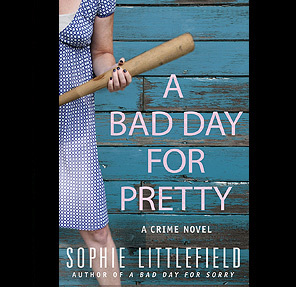 Sophie Littlefield is someone I can point towards being a great support. Her book ‘A Bad Day for Pretty’ was released earlier this year and has garnered rave reviews across the country. She also has an upcoming Young Adult fiction that sounds awesome and is supposed to be released in October. Check out her website here! Other authors in the SF RWA chapter include JoAnn Ainsworth, Tawny Weber, Brenda Novak, Carolina Montague, Christine London, Bella Andre, Veronica Wolffe…the list goes on and on and I’m majorly lucky to be in such a great chapter. To see the entire list of authors, click here! The fact there are so many published authors in SFRWA is invaluable to me as I go ahead with my writings. It’s a tough task to balance family, work and novel writing. RWA represents, and if you’re an aspiring author, please consider joining. It’s been a gift for me as I look towards publishing my first novel. Self-publishing: Changing Model, Getting Respect? There was a recent article at Publisher’s Weekly written by Ann Byle about the current status of self-publishing in the industry. Self-publishing: Changing Model, Getting Respect. The look she gave me was the most telling on how she felt. She’s found success going the traditional route, so I guess she may be biased, but I believe she’s not alone. I believe that many authors still hold a negative bias towards self-publishing. I can’t really blame them – many of the self-published books I’ve read (or tried to read) have major editing issues. I can’t remember a recent self-published book that I’ve read from beginning to end. But the opportunity that self-publishing provides can’t be ignored. Authors have to champion their books more than ever, even through a traditional publisher. I believe the lines between self-published and traditional are more blurred than at anytime in the history of the publishing industry. Book stores continue to downsize and large publishers are looking for money-making titles; it’s a longshot that any debut author will be an instant success. Publishers would rather sign celebrities to book deals because it mitigates the risk of losing money since a celebrity already has a following. I cringed when I heard pop star Justin Bieber got a book deal to publish his memoirs. The dude’s only sixteen years old! And he’s publishing a memoir! From a publishers perpective, it’s pure genius. This kid has millions of fans who would probably line up to buy his book. Cha-ching for Harper Collins! I did smile at the announcement of Betty White’s two book deal with G.P. Putnam’s Sons, a division of the Penguin Group. She’s paid her dues at 88 years-old, and let’s be frank…how can you not love Betty White? But Justin Bieber? Shouldn’t he wait until he’s at least twenty-one years old to publish a memoir? It’ll be interesting to see where the self-publishing debate stands a year from now. Will the lines be more blurred? Will there be a self-published book on the NY Times best-sellers list? Will there be another J.A. Konrath to talk about? For now, I’ll continue to write in the cave hoping for the best. The reactions are coming in on Dorchester Publishing’s announcement they are ditching mass market publishing in favor of an e-book business model. I predicted this would happen to traditional publishers in my January 2010 posts, but my crystal ball was a few years down the road. It’s all happening so fast that so many authors I know are just rolling with the punches not sure where the industry is headed. If you take into account the downsizing of staff and number of stores at B&N’s and Borders, the shift in the publishing industry is well under way. I haven’t had a book released yet and I’m still struggling on how this will affect me! It’s still my belief that e-book sales through the iPad and Kindle will reach about 20% marketshare by summer 2011 with younger readers leading this charge. Bookstores will continue to downsize and traditional publishers, the big New York publishers, will be very conservative on the number of books they print. New authors will have to work even harder to get a traditional publisher to take them on. To me, this is a scary, yet exciting time for a new author to enter the marketplace!